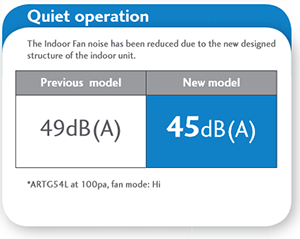 Most air conditioners in Australia now have a noise (dB) rating on them. It can be frustrating trying to listen to a program on TV or Radio with an annoying noise in the background. 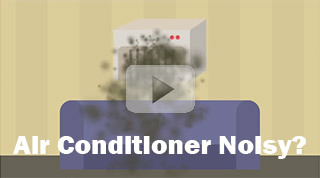 When purchasing an air conditioner it is hard to know what the noise of the air conditioner will be when installed. Ducted air conditioners are quietest, followed by split system air conditioners, followed by refrigerated air conditioners and finally evaporative air conditioners are the loudest. Generally it depends on the proximity of the unit. Wall or window air conditioners have a tendancy to be noisy due to being close to where you are, whilst a ducted system has the noisy components on the roof. The air conditioner fan circulates cooled or heated air around your room. Models with a wide airflow range allow the air to be directed easily to the whole room. Multiple fans speeds help with air conditioner noise. Look for models with different fan speeds from very high, to help the room cool down quickly, to very low, so there's reduced noise and once you have the right temperature.